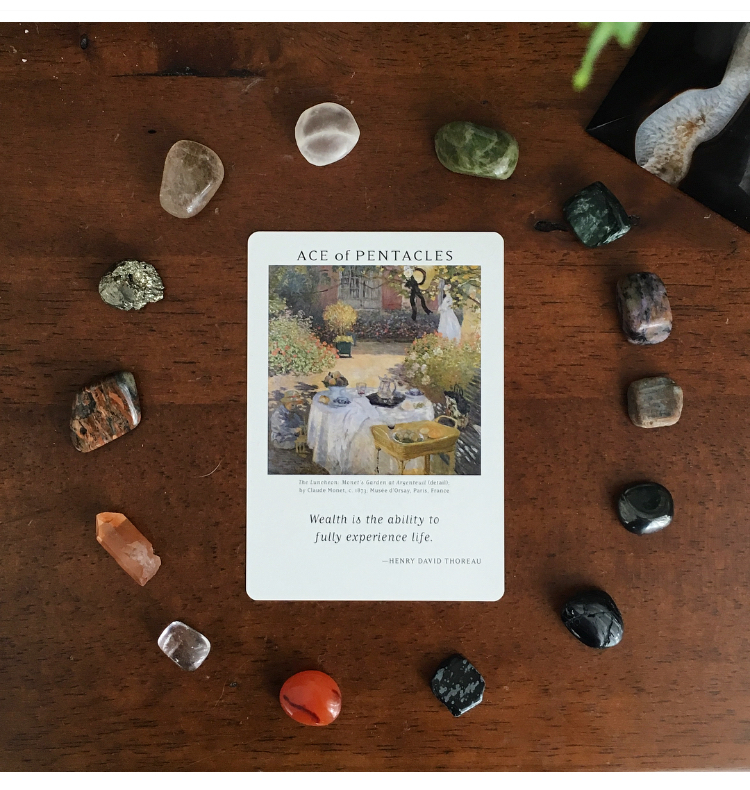 This month, the tarot theme we have is the Ace of Pentacles — prosperity, abundance, wealth, a new beginning that can be ever so fruitful. And this seems, to me at least, quite shocking of a theme. In November? In Autumn, the season of death, there’s new life? In this chaotic astro weather, there’s prosperity? I often gauge the collective energies based on my own. As within so without. And I often trust that the souls who are attracted to my energy and read my words do so with a purpose and the message I have is for you in particular. So to share a bit of how I myself am feeling, it’s not so hot. Saturn is making a square to Chiron, and although it’s not transiting my natal Chiron, I can feel the gravitational pull it’s having on Chiron's place in my chart. Chiron is the wounded healer of the zodiac, and represents how we cope with our shadow self. And I feel like ALL of my skeletons are trying to break out of my closet. I feel like I’ve worked so hard to tend and heal my wound, and now Chiron is grabbing a screwdriver and jabbing it into the semi-healed wound saying I need to start over in this process. It is something that makes me question if we can EVER heal or accept our Chiron. Can we ever fully heal our wounds, or rather, accept and live with our wounds, and help others heal by sharing our knowledge and experience? I’m afraid to say that the wound never heals. It was death that saved Chiron in his moments of desperation. Could that mean a figurative death, of the self, or is it only when we have finished this life that we are free of the burdens it bears. Anyways, if you too have been feeling your wounds reopen and fester once more, you may also be questioning the theme of prosperity and abundance along with me. But alas, it’s there, reminding us that we have the power of manifestation. It’s what we give our energy to that grows and blossoms. Plants cannot grow unless you sow the seeds. And if you aren’t an active gardener of your mind, then the weeds will take over. Weeding is a diligent process. We need to constantly pluck out the negative thoughts, the self doubt, the guilt, the fear, the shame, and constantly tend to the compassion, the kindness, the gratitude, the forgiveness. But, weeds do serve a purpose. It’s not for nothing. Weeds are full of nutrition, which is why they grow so profusely and refuse to die. And they can be added to the compost, so as they decompose, they can be recycled and give nutrition back to the garden of our mind and soul. Don’t just shove away the shadow self, the negative thoughts, the fear, the guilt, the shame, etc. Allow it to teach you something. Know that all emotions have a purpose and a place. Even if you might not see those as highly nutritious for you soul, remember that they exist because they are resilient and strong, and that they have had generations to grow into something that can withstand anything. The mental and emotional wounds in our bodies have become part of that ecosystem. Plucking out a weed doesn’t mean it won’t come back, those roots run deep. And it takes a lot of time and effort to keep tending to them. If you pluck a weed at the surface, it grows back stronger. You can’t just buff the surface of your wound and assume it’s healed. You need to keep revisiting that wound, to nurture it, and love it, accept it, embrace it, forgive it, all the while sowing the seeds of what you do want to see in your life.